BHSU Volleyball sweeps the SD School of Mines Tuesday night in Rapid City. RAPID CITY, S.D. 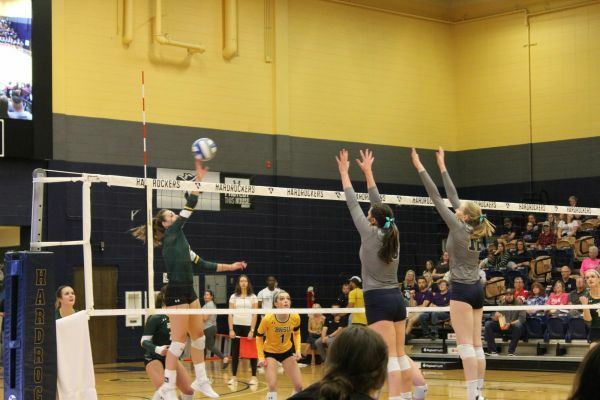 – The Black Hills State University volleyball team swept South Dakota Mines, 3-0, to kick off rivalry week. The Green and Gold won by scores of 25-14, 25-18, and 25-18. "It was a great to finally have a match where emotional consistency and statistical consistency happened at the same time," head coach Kristin Carmichael said. "We were very aggressive on offense and our back row wouldn't let anything drop. A rival road win is always great momentum and we need that leading into this weekend." The Yellow Jackets found momentum early in the first set after two service aces from Valerie Blake and Laurel Lech, to lead SD Mines, 4-1. The Green and Gold went on a 4-0 run to push further ahead of SD Mines. A kill by Laurel Lech moved the score to 17-6 in favor of Black Hills State. The Hardrockers went on a 4-2 run to bridge the gap, but the Yellow Jackets took the initial set, 25-14. Black Hills State kept the same energy to go on a 6-0 run, leading the Hardrockers, 7-2, in the second set. SD Mines responded going on its own 7-2 run to tie the set. With back-and-forth action carrying out in the set, the Yellow Jackets took a 16-13 lead after kills from Sierra Stugelmeyer and Ellise Lech. An attack error from SD Mines would give the Green and Gold a 25-18 set victory to lead the match, 2-0. The third set was a back-and-forth affair with neither team setting a substantial lead. The Green and Gold used a 4-0 run to jump ahead of the Hardrockers with a 13-9 lead and never looked back. The Yellow Jackets went on to take the set and the match, 3-0. Stugelmeyer led the way for the Yellow Jackets with 12 kills, followed by Carisa Becerra with 10. The Green and Gold will return for home matches against Western State and Colorado Mesa on Oct. 5 and 6. Game time is set at 7 p.m. on Friday and 5:30 p.m. on Saturday at the Donald E. Young Center.